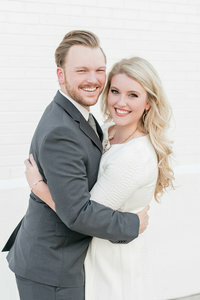 Hannah and Cameron are a gorgeous couple who are so in love, and that was so evident during their engagement session. Hannah is so friendly and kind, and she has the most beautiful smile! Cameron is so polite and dotes over his bride. They are perfect together! Hannah and Cameron first met at a close friend’s funeral. That’s definitely not the start of a love story you hear every day, but it’s beautiful to hear them explain their story. They recognize that something amazing blossomed out of such sad circumstances, and they believe that their friend, Adam, brought them together. Isn’t that incredible? These two are tying the knot at Foxwood Events in Gordo, Alabama, right outside of Tuscaloosa. The venue is owned by Cameron’s family, and we’ve already toured the property when we shot Hannah’s bridal session there. We are so excited about this gorgeous place, and we can’t wait to get them in front of our cameras again!